In 2003, the Lyric held an international architectural competition and selected O’Donnell + Tuomey as architects to design a new theatre facility. In May 2008, Belfast City Council granted planning approval for the development of the new Lyric Theatre. The development included the demolition of the existing theatre and the construction of a new building for use by the Lyric providing auditorium, rehearsal and studio theatre together with related technical facilities. Further accommodation includes reception, bar / foyer, offices and an education room. With demolition of the existing theatre completed in 2008, the appointed contractor for the new theatre, Gilbert Ash, commenced work on site in March 2009. The new Lyric Theatre opened in May 2011. Design in response to context and functional brief The Lyric is sited between the characteristic grid pattern of the surrounding Belfast brick streetscape and the serpentine parkland setting of the river Lagan. The client brief for the new theatre has been developed and tested in relation to best current practice in contemporary building and the architectural design has been developed to embody the functional, cultural and social aspirations of the project. Our architectural design concept responds to these conditions by housing each the 3 principal functional elements of the building within its own distinctive brick box, with the public circulation spaces and staircases wrapping around the fixed forms of the theatre, studio and rehearsal, standing on the sloping ground of the site like rocks in a stream. The skyline of the building displays the constituent ingredients of the conceptual design. The solid sculpted brick volumes linked by transparent permeable public spaces are intended to visually connect the street through the Lyric woods to the continuous flowing line of the river through the city. Seen from the river, the new theatre is expressed as object crystalline forms in a parkland. The irregular outline of the boundaries of the site and the constraints of the sloping ground have given rise to a site specific design solution. The large auditorium with its backstage fly tower has been sited back from the street line to minimise intrusion on the scale of the surrounding urban context. A 389 seat theatre in a single steep rake, the body of the audience not broken by balconies, the actors in the same room as the audience. The parabolic section of the raked seating has been developed with the assistance of a computer analysis to ensure optimum sightlines from every seat. The seating layout is creased along one line, folding slightly, like an open hand to hold the audience, focused on the stage but within sight of each other. The faceted acoustic lining is in the shape of three timber arches, encloses the audience. The space has been designed to encourage and intensify the intimacy which is the most successful characteristic of the existing Lyric. The studio space is a 6 metre high brick ‘empty space’ warehouse performance space. Its flexible layout provides for end stage, traverse, thrust, in the round, cabaret and promenade performance possibilities. The layout provides additional staging possibilities for readings and concerts. The studio has been sited along the street frontage with a picture window to provide visual communication between street and theatre activities. All the building materials are selected to endure and will be crafted to weather with age. 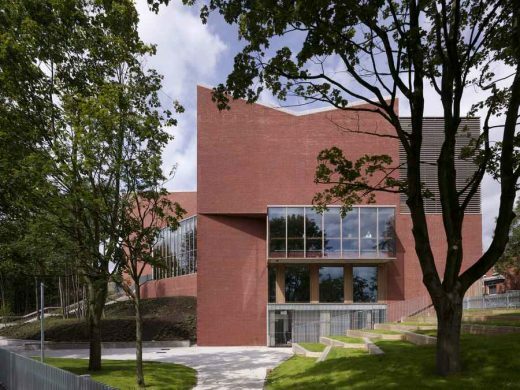 Built in ‘Belfast’ brick, the new building holds one corner of the continuous system of brick streets, the last building on the grid marking the corner of Ridgeway Street and addressing the River Lagan. All external windows, doors and screens are hardwood timber Brick, timber and stone also form the fabric of the internal public spaces and bespoke furniture throughout the building. The public approach up a gently rising sandstone stair from the street and enter a dynamic foyer space leading from the welcome desk/box office to the Lyric bar, with a flowing stairway to the upper foyer which overlooks the River and from which both performance spaces are entered. The spiralling circulation pattern empathises the generating force of the performance spaces at the centre of the plan. O’Donnell + Tuomey Architects are currently engaged in the design of cultural buildings, schools, housing and mixed use buildings in Ireland, the Netherlands and the UK. Sheila O’Donnell and John Tuomey have taught at schools of architecture in the UK and USA; currently Sheila is a studio lecturer and John is Professor of Architectural Design at University College Dublin. They represented Ireland at the Venice Biennale in 2004 and 2008 and won the RIAI Gold Medal in 2005. In 2010, they were elected as Honorary Fellows of the American Institute of Architects.